Mr. Mittal received his MS in Statistics from Indian Statistical Institute (1966) and his MS in Operations Research from University of Pennsylvania (1971). After graduating from Indian Statistical Institute, Mr. Mittal taught Statistical Quality Control, Operations Research and Production Management at Indian Statistical Institute and Indian Institute of Management, Calcutta. While at University of Pennsylvania, Mr. Mittal taught Statistics to undergraduate students and assisted teaching Operations Research to graduate students. 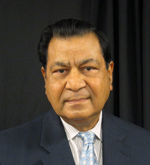 After graduating from University of Pennsylvania, Mr. Mittal taught Statistics, Operations Management, Econometrics and Computer Science courses at LaSalle College, Jefferson University and Community College of Philadelphia. In 1979, Mr. Mittal joined General Accident Insurance Company in Philadelphia. He attained his ‘Fellow of Casualty Actuarial Society’ (FCAS) designation while working at General Accident and managed the pricing of personal and commercial property and casualty insurance products. In 1999, Mr. Mittal moved to London to work for XL Insurance (formerly Winterthur Insurance) to manage the financial reserving function. A major part of this assignment was to set up an outsourcing operation for the company’s Actuarial work. Mr. Mittal set up this operation in India in 1999 and trained the student actuaries in India. In 2002, Mr. Mittal moved to India to accelerate the technical and professional development of student actuaries in India. In 2005, due to the overwhelming success of the Actuarial outsourcing operation, the operation in India expanded to an outsourcing operation for all functions of the company including underwriting, claims and finance and accounting. In 2008, one of the student actuaries in India qualified as FCAS and Mr. Mittal returned to the US in 2009. Page last updated by Department of Economics at 9:35 am August 24, 2018 . This page was printed from http://economics.camden.rutgers.edu/faculty/madan-mittal/ at 10:48 PM Thursday, April 25, 2019.